NEW BRITAIN - Polish, Syrian, Sudanese and Puerto Rican people held hands and discovered their feet moving in harmonious rhythm over the weekend. 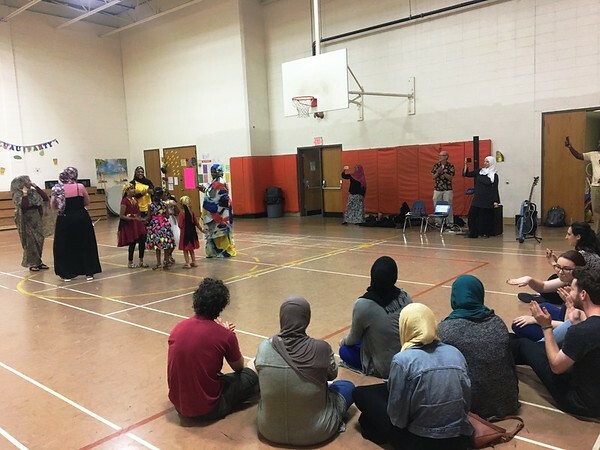 “Moving Across Cultures” took place at the YWCA Sunday morning, bringing together local families of different ethnic backgrounds for an interactive experience combining dance, culture and language. The event kicked off a collaboration of the Islamic Association of Central Connecticut and Middlebury College’s Center for Community Engagement. 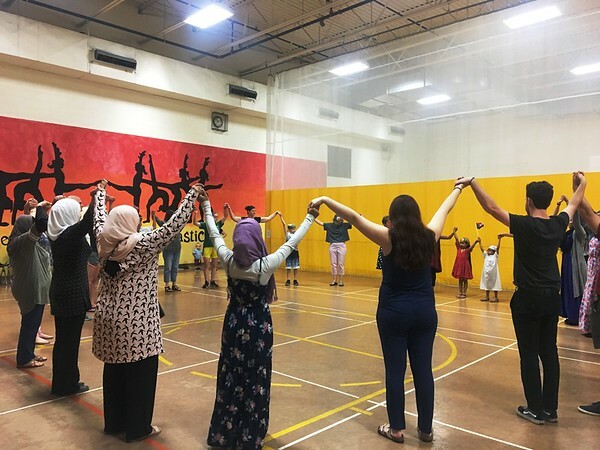 Jiran: the Arabic Community Action Summer connects advanced Arabic students with immigrant and refugee families who are new U.S. residents. “This is lovely; I was hoping we’d have a lot of people,” said Maha Abdullah, one of the organizers. She worked with Jiran Director Emily Goldman, along with music and dance teachers Debby Szjanberg and Robert Hugh, to run Sunday’s program. Their ultimate goal is to help Arabic-speaking families adjust to life in New Britain and to bridge gaps left by social service organizations, while providing a mutual learning experience for the students and families. As a teacher at Pulaski Middle School, she has watched the city’s Arabic-speaking population grow over the last few decades. Muslim families have come from Sudan, Syria, Morocco and other countries. A large group from Sudan attended the musical program. “They’re doing a lot of good things for the community, especially people that speak Arabic,” Magda Abdalmageed said, as she and her daughter joined the dance circle. Szajnberg and Goldman then led everyone in counting “1, 2, 3” in different languages. People counted in Spanish, Polish, Italian, German, Croatian and Bulgarian. 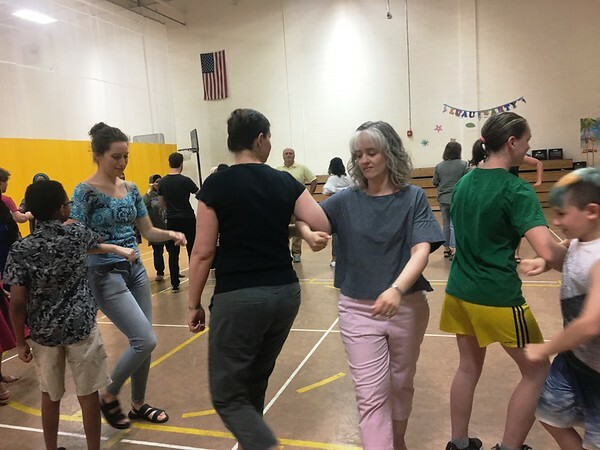 “Music and dance is a wonderful way to get people together,” said Hugh, who played and stopped each song at appropriate times as Szjanberg explained each dance and game. Goldman called Jiran “an experiment” and hopes it benefits the New Britain families taking part as well as the students. Kristi Delaguila and her 1 1/2-year-old son Eli watched with curiosity as several Sudanese girls wearing ornate, colorful outfits demonstrated a traditional dance from their family’s home country. During the last 15 minutes of the program, Eli joined in, clapping and dancing with the others. “We speak Spanish and English at home, so it’s nice to hear other languages,” Delaguila said. Ljiljana Cohen came to support Goldman, her friend, and ended up leaving with some new friends too. Jiran organizers are hoping other members of the public will join them at upcoming activities and workshops. The program continues this evening with a screening of the film “From Nowhere” from 6 to 8 p.m. at New Britain Public Library, 20 High St. It will be followed by a discussion with the film’s writer and producer, Kate Ballen. A full list of activities can be found at Facebook.com/Jiransummer. Posted in New Britain Herald, , New Britain on Wednesday, 11 July 2018 20:13. Updated: Wednesday, 11 July 2018 21:13.